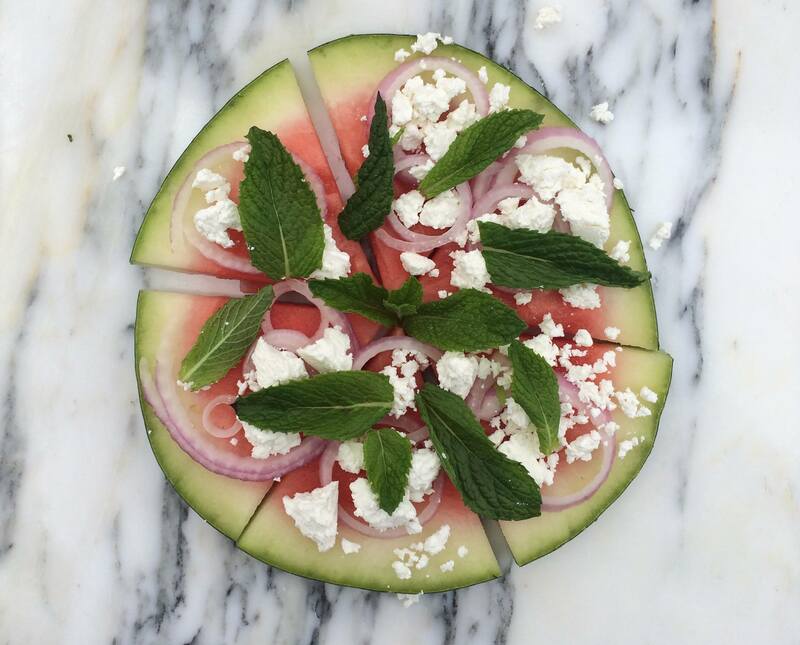 Watermelon feta salad is a favorite of mine. 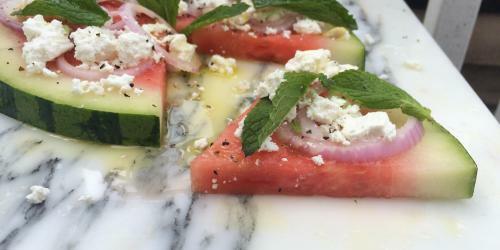 It may see weird to the uninitiated to combine creamy, salty feta cheese with juicy, sweet melon, but the stark contrast of the flavors works phenomenally well together. 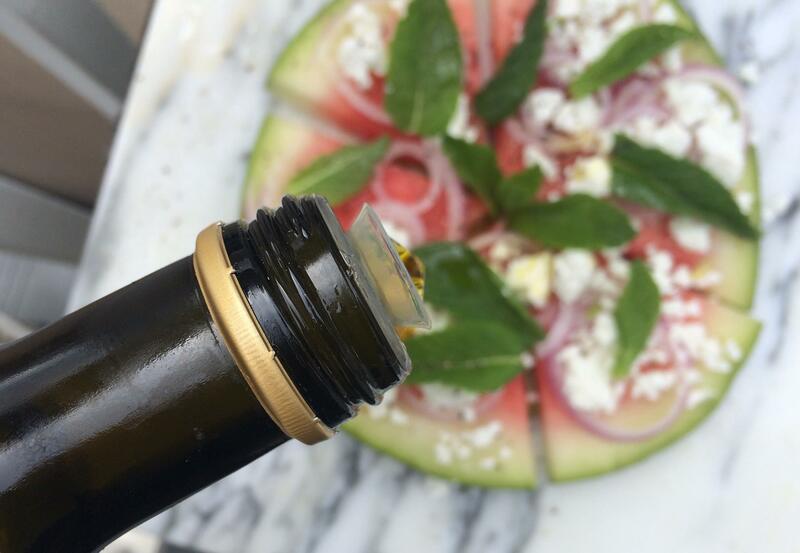 Just as watermelon is balanced gorgeously when served with savory grilled steak, the tang of the crumbled feta, plus some bright lemon juice for good measure and a good glug-glug of fruity extra virgin olive oil turns this classic summer snack into a positively savory salad. Even better, it's pretty fun to eat. 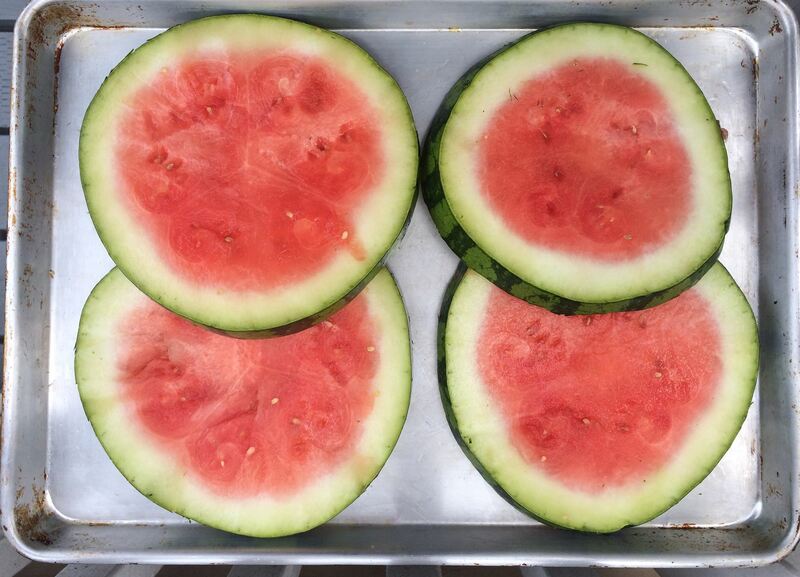 It all starts with a seedless watermelon. You really only need half of one for this recipe, but I usually buy them whole anyway, since they're such a tasty, healthy snack to have on hand. 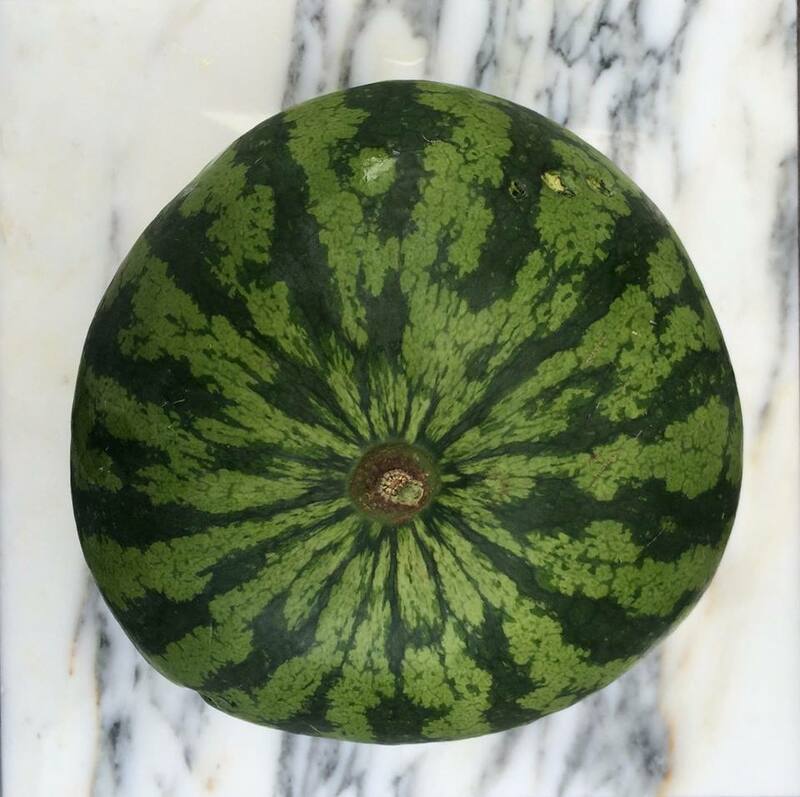 Look for a spherical melon with a dark green rind (and make sure it's seedless--seeds are no fun to deal with in this preparation). 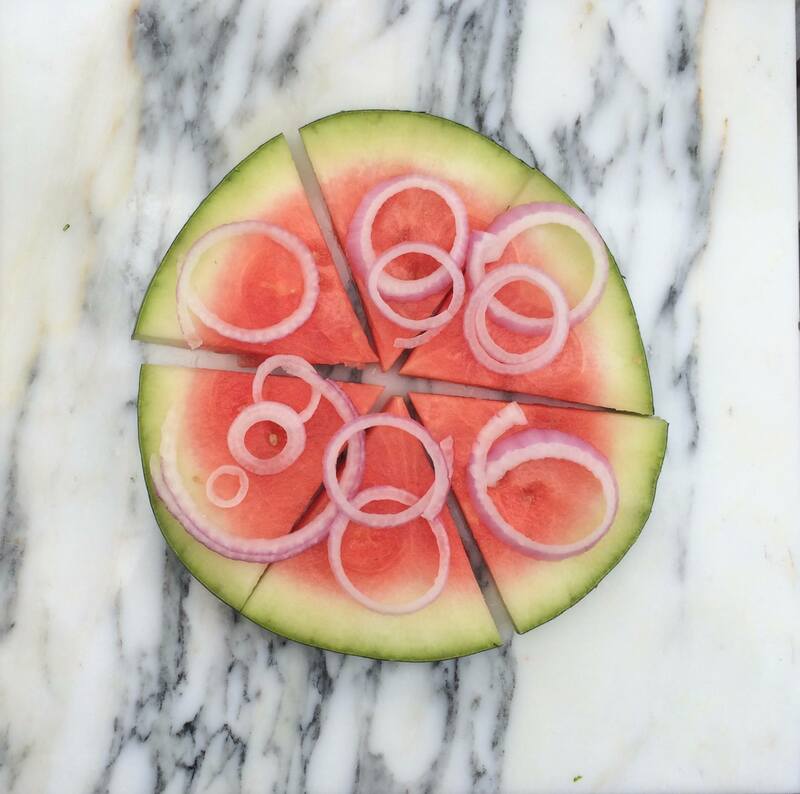 This is a salad for 4 people, and each person gets his or her own "pizza," so slice the melon into 4 rounds (or more, obviously--this recipe is very easy to scale up or down). Next, we turn our watermeolon rounds into "pizzas." This happens magically, by slicing each one into 6 triangular slices and placing it on a plate. See? It's basically a pizza. Then a light layer of thinly sliced red onions gets scattered over each slice. Feel free to go extra-light on the onions if you're not a fan. Then do the same with that creamy, crumbled feta cheese. Remember to get every slice so each bite has a little of everything. Next, some mint leaves, for freshness. And finally a squeeze of fresh lemon juice, a drizzle of good extra virgin olive oil, some black pepper, and a tiny touch of salt. 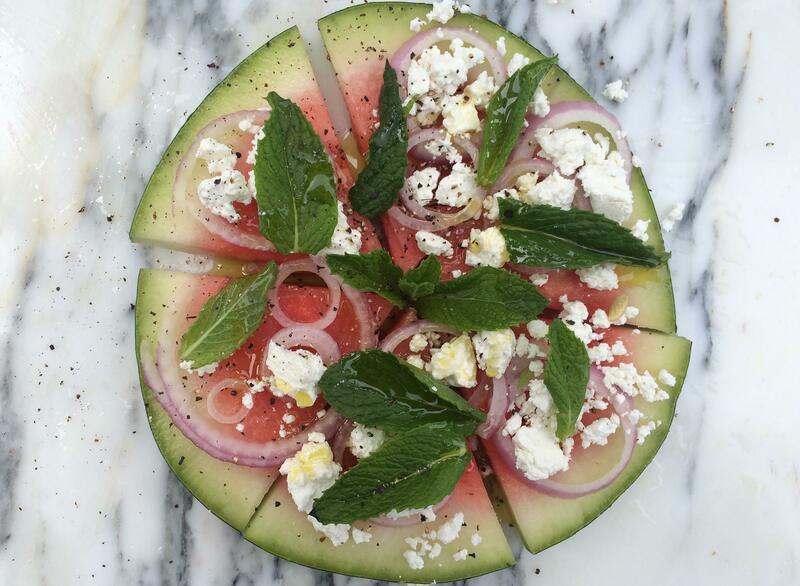 OK, fine, It's watermelon salad pizza time. 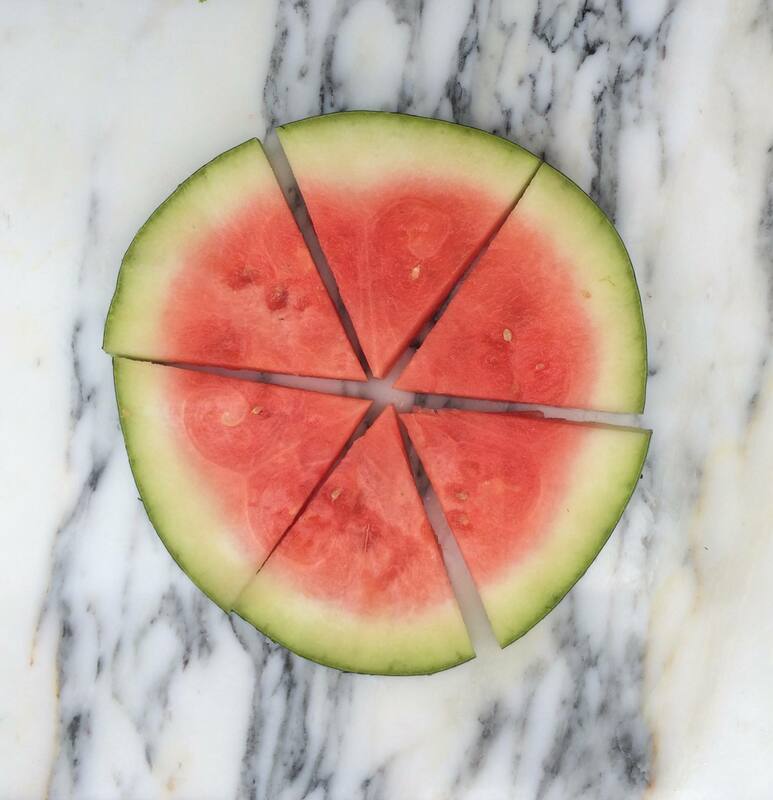 Cut each watermelon round into 6 triangular slices, as if cutting a pizza. Arrange the slices in a circle on 4 dinner plates, so it looks like you have 4 pink pizzas. Top each "pizza" with the red onions, making sure to get some on each slice. Scatter the feta over each pizza, making sure it is is distributed evenly to each slice. Do the same with the mint, scatteing it over the slices, making sure there is at least one leaf on each slice. Drizzle the "pizzas" with the lemon juice and the olive oil. Top with cracked black pepper and the tiniest sprinkle of salt (the feta is quite salty, so it only needs the tiniest touch of salt). I eat Granny Smith apples daily with Bulgarian Sheep Feta, drizzled with honey. I have been eating watermelon and Feta for a long time too. Usually a minimalist it is tempting to try your recipe. Probably not the oils but yum. What a good idea for the summer! The ingredients are tasty and I’m always looking for new ways to serve salads. This is quite innovative! Thank you for this great information, you write very well which i like very much. I have seen so many food websites but the way you have conveyed this is amazing. You have literally showed the step by step process of making this. This recipe looks delicious! Your blog is fantastic! We would love to have you as a recipe partner at Chicory. What a great idea for a summer barbecue! Bought a watermelon on the weekend and I’ll definitely be using some it to make this salad! Cheers! Great and simple recipe you have mentioned here. This will be healthy and tasty. Looking to this image I feel like that. such a great pleasure to read this blog recipes. Thank you for giving posts and articles were very amazing. I really liked as a part of the article. With a nice and interesting topics. Has helped a lot of people who do not challenge things people should know. You need more publicize this because many people. Who know about it very few people know this. Success for you….!!! I am gratified to catch a glimpse of your blog and I conceptualize it. It is a fascinating blog. It is your gratefulness for capitulating and giving out with us. Thanks a lot. The need for a sack trolleys in almost every warehouse, go down and factory makes use of it that too on a regular purpose. There is a host of activities that is part of this blue cross insurance plans, which include health fairs, monthly checkups, proper care and complete treatment benefits in case of any emergency. I have many exciting software which I want to share everybody. These are the softwares which is used on the computer and the mobile. These are baixar mobogenie, facebook and whatsapp. You can access web baixar facebook to download this and baixar whatsapp to whatsapp download. Have nice day! The demand of rc quadcopter is on rise, if you are looking for this quadcopter, visit us. We have exciting range of quadcopters that are equipped with latest technology including camera. Here at cabbage tree solutions, you are assured of the best French transcription services in French as well as in the shortest time frame which of course is your desired deadline for whichever work you task us with. Hiring professional Skip bin brisbane bayside is the best decision that makes sure your home or office is renovated or built in the way you want to. I appreciate you and hopping for some more informative posts. Thank you for the information you provide. I had a look to start my own. I like play games <a href=“http://pianotiles2.com/”>Piano Tiles 2 game</a> online, <a href=“http://scorehero.net”>Score Hero game</a>, <a href=“http://dreamleaguesoccer.net/”>Dream League Soccer</a>, <a href=“http://b612az.com”>b612</a> and <a href=“http://descargarb612az.com/”>descargar b612 gratis</a>. How about you? with just one spray a person can get the perfect look on their body. There are various software and online sources available in the market that offers a quick Convert Webpage to PDF. Unlike in the past, today a home business can claim a share of global market, thanks to the web that enables even small businesses to reach all corners of the globe. It is necessary to have Brisbane skip bins that make sure that such wastes are disposed in best manner. They remain open on all weekdays to offer superior quality medical expertise to their customers. 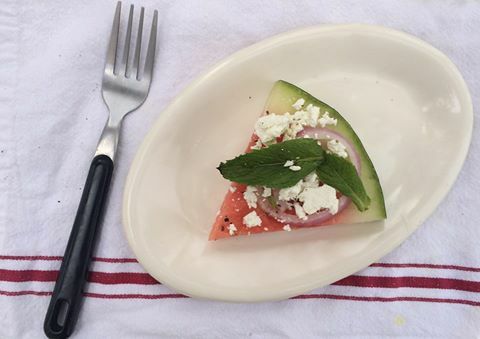 I admire the creativity that you have used to come up with a watermelon salad pizza. 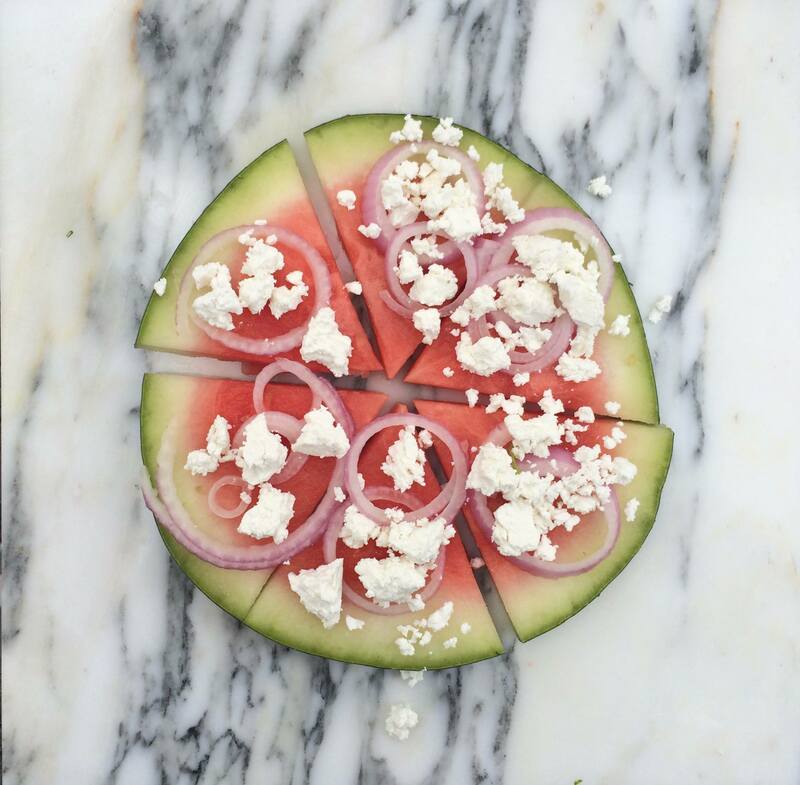 Who would have thought it is possible to come up with such a delicious watermelon salad pizza? Thanks for sharing that recipe with us. Many thanks for another fantastic article, I always get back to your website to learn what you compose. Just as watermelon is balanced gorgeously when served with savory grilled steak, the tang of the crumbled feta, plus some bright lemon juice for good measure and a good glug-glug of fruity extra virgin olive oil turns this classic summer snack into a positively savory salad. Great blog. Cheers for showing us. iPhone have a line of smartphones designed and marketed by Apple Inc.They run Apple’s iOS mobile operating system.The most recent iPhone model is the iPhone 7,Now to use Iphone 7 without any Problem and restrictions imposed by Iphone’s IOS. It’s really a great and helpful piece of information. I’m glad that you shared this helpful info with us. Please stay us up to date like this. Thank you for sharing. Great ¡V I should certainly pronounce, impressed with your web site. I had no trouble navigating through all tabs as well as related information ended up being truly easy to do to access. I recently found what I hoped for before you know it at all. Quite unusual. Is likely to appreciate it for those who add forums or anything, website theme . a tones way for your client to communicate. Excellent task..
Hello there, You have done an excellent job. I will definitely digg it and in my view recommend to my friends. I’m sure they will be benefited from this website. I wanna inform you that Cyber Monday sale is out now.You can get latest discount coupons here.Thank you. After a long web research on my subject, I discovered about all issues determined for attire with your post. Incredible details! The name itself feeling crazy. The watermelon salad Pizza. The one that we can prepare in a shortest time. This will really tasty as the picture says. I will make it for my husband and i am sure he will like this. It’s a best side to searched based quality content to determine results. I do not eat watermelon salad pizza yet, its looking amazing, i really sweet melon now its session, its one of the best fruit i love watermelon. yayyy!! it’s the seaon of melons again :D i am so happy that i found out this recipe in serendipity. it feels so powerful. i will definitely try this as soon as poosible. Thanks for that one great post. I consider new things with concepts are essential in your content and can generate the much free information for us. Well done, so useful! Watermelon is surprisingly healthy fruit as it is combination of water and fiber without a lot of calories. Watermelon salad is also an all-time favorite salad with some fun to eat. Very nicely you represent here every step of making a delicious watermelon salad pizza. We are planning to arrange small party on this weekend at our office CV Folks where we are providing best executive CV writing services – professional assistance to write a receptionist CV – https://www.cvfolks.co.uk/receptionist-cv/ for a full-time or part-time position. Thanks for sharing this yummy recipe. You really only need half of one for this recipe, but I usually buy them whole anyway, since they’re such a tasty, healthy snack to have on hand. I know this article is late but have to admit the information in the article is very useful. Thanks for sharing. Awesomeasd Look forwadaard to hearing more of your wisdom soon! Thanks. ExcellasdasdaIm really impressed by your site. loving your Post . Bundle of Thanks! A great and new dish from the familiar ingredients. Thanks a lot. I will cook for my family. Great job man, I am really enjoyed to be here. Notwithstanding, before you choose to chance your auto utilizing automobile title credits, read these tips first. You could stay away from some possibly exorbitant missteps on the off chance that you comprehend what to look out for. Hello Everyone who you are getting hot call Girls in Gurgaon.. The article is great, there is a lot of useful information. Thank the author very much. Thanks for the nice blog. It was very useful for me. I m happy I found this blog. This is a great blog on watermelon! I appreciate the salad pizza. It is really tasty! MEmu is an Android emulator that has practical experience in computer games, because of which you can appreciate any of the numerous selective titles you can discover for cell phones and tablets, specifically on your PC. You don’t have to alter convoluted settings and arrange the controls, simply introduce it and begin playing. Introducing Android recreations on other Android emulators can be moderately muddled, yet with MEmu, you simply need to tap the APK catch on the correct side of the interface, select the APK of the diversion you need to introduce, and hold up a couple of moments. The amusement will then be introduced and prepared to play. Conflict of Clans, Subway Surfers, Minion Rush, and Geometry Dash are only a portion of the amusements you can play on your PC with this emulator. Introducing recreations isn’t the main simple activity on MEmu. The controls are normally effectively set up, so you can play any amusement with either the mouse or the console instantly, as you lean toward. Also, on the off chance that you don’t care for how the controls are designed, you can simply change them, which is super simple to do. You can even utilize an Xbox 360 controller or a comparable one. <a href=”https://memuguide.com/memu-player-faster-improve-performance//”>Memu Android Emulator</a> is an excellent Android emulator that gives you get to the entire list of recreations for this working framework on your PC. We’re discussing a huge number of diversions, all free, which you can appreciate on your PC. The best thing about it is that you don’t require an extremely ground-breaking PC to run the amusements flawlessly. Above all else, a few points of interest for reference. The implicit emulator on Android Studio or on virtual machine directors like VirtualBox does give you a chance to set up higher renditions of Android, however the outcomes when running applications over them have a tendency to be somewhat touchy. Be that as it may, MEmu is an exemption, as one of the main Android emulators particularly intended to run video games requiring 5.1 Lollipop. Memu mimics past renditions of the Android working framework (Lollipop and KitKat, with additional in transit). It does this on other, work area working frameworks, which means you can run applications and diversions that are selective to Android on different gadgets. You can likewise tinker with the Android condition itself, discover how it works, or test things as a designer. Note that as an Android emulator, <a href=”https://memuguide.com/memu-player-faster-improve-performance//”>Memu play</a> isn’t a fitting decision for a few recreations. For instance, however it can run Pokémon GO (as its very own site promotes), a work area does not have the GPS (or versatility) expected to really stroll around and get Pokemon. Rather, you’d have to remunerate with GPS faking programming, which (as it regularly seems to be) is against the amusement’s standards. With this seeing, however, Memu works splendidly. It reenacts the most recent forms of Android and, with a PC that can deal with the assignment of copying, can both play recreations and run different applications. For a few purposes, Memu won’t supplant a telephone. In any case, if all you require is to play a diversion or there’s some particular usefulness an Android application has, you can do it from your work area. It’s likewise a phenomenal device for little application designers. On the off chance that you have to run Android on your work area, look here. Very effective post, it’s give me new ideas on my life. Trenoven Review [WTF] Must know The TRUTH About Max Gains Trenoven! Trenoven is the latest muscle building supplement developed by Max Gains. Must read Max Gains Trenoven real review from real Trenoven user, and find link where to buy Trenoven. Looking forward for more amazing posts like this one. Loved these amazing recipes. Your website contains such useful information. Appreciate your written skills and your blog. This is such a nice article. Thank you so much for sharing your knowledge. Keep it up. You have made some good points there. It provides me great pleasure to reading your posts. am glad to be one of the visitors on this outstanding website.